More discontinued classic K'NEX parts are listed below. 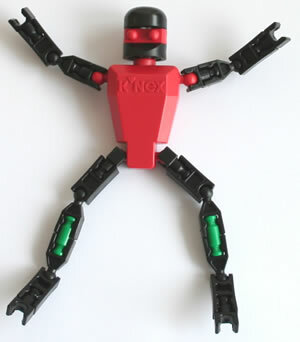 Click on any image to view further details, or view current classic K'NEX parts. 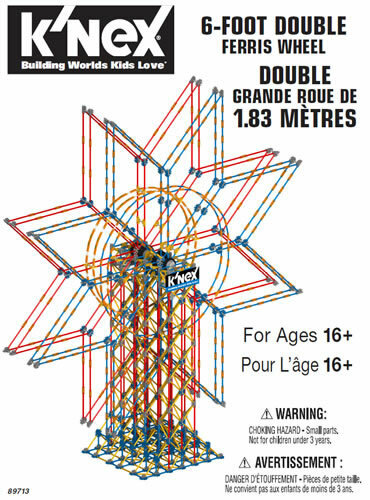 Large black K'NEX gear, 130mm diameter. 82 teeth. 130mm diameter with 82 teeth. The pack includes 2 x K92875 battery motor, both connected by a long flex to a single hand-held controller. The two rocker switches on the controller provides forward and backward movement independently for each motor. 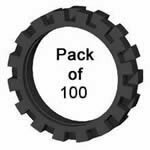 Ideal for K'NEX robots and other steerable vehicles. Requires 2 "AA" batteries (not supplied). 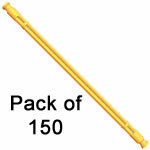 K'NEX Solar lead, 50cm in length approx. 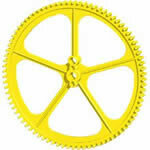 As used in K'NEX Solar Energy sets. Requires the K92660 Solar motor and K92680 Solar panel for operation. Similar to 92875 K'NEX Battery Motor Red, but instead of a battery box, this motor just has a 2.5cm (1inch) lead, for you to connect to your own 3v power supply. Ideal for K'NEX professionals and hobbyists. Product code has changed - see Alternative. Set of two coaster cars (front and back car), plus two people. As used in all current Classic K'NEX Roller Coaster sets, such as the K'NEX Thunderbolt Strike roller coaster. Colours may vary - blue or orange. 1m length of Blue roller coaster track. As used in K78880 K'NEX Roller Coaster Physics set. Orders for more than 1m of track will be supplied whenever possible as a single continuous length. Please note that these parts may be slightly dusty, and that orders for two or more torso halves may be partly supplied as assembled torsos. Please note that orders for two or more torso halves may be partly supplied as assembled torsos. Clock Components for 89774 Grandfather Clock set. Requires 3x "AA" batteries. 43mm diameter approx. Fits onto the end of a classic K'NEX rod. Used either as a skid plate, or the centre of the eyes in Moto-Bots sets. K'NEX Missile Launcher plus 3 darts. As used in the 31480 Combat Crew 5-in-1 set. Attaches to any classic K'NEX connector. As used in sets such as the Hometown Carnival. Actual person supplied may vary from photo, depending on stock available. 75mm long and 10mm wide approx. 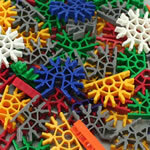 Do you enjoy building KNEX models to your own design, but need something a bit different and exciting to build with? This pack of 32 multicolour KNEX panels opens up all sorts of possibilities, from castle walls and pterodactyl wings, to racing car spoilers. Pack contains 16 mini panels and 16 small panels. Colours may vary. Do you already own a K'NEX 50-model set (71941/12211) or K'NEX 70-model set (13419/17435)? If so, why not buy our exciting Motor Add-on kit, and build 10 motorised K'NEX models? The pack contains 71 bonus parts, including a K'NEX Battery motor, plus online instructions to build 10 motorised models: Brontosaurus, Car, Dune buggy, Fairground ride, Fan, Flapping bird, Radio telescope, Rescue truck, T Rex and Walking scorpion. 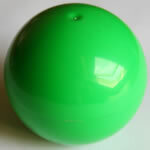 in a variety of colours (Black, Green, Yellow, Blue etc). Pack weight 5Kg. Please email if you would like more information on pack contents. Pack containing 16 sets of the main four K'NEX K-Force Blaster parts - body, grip, pull back ring and trigger sleeve. 8 sets are in blue, and 8 sets are in red (ie colours not as shown in the image). Pack of K'NEX Tyre Medium. 65mm (2.5 inch) diameter approx. Fits onto the 90979 Pulley Medium. Pack weight 1.95Kg (4.2lb). Pack of Rod 32mm White. Weight 0.22Kg (0.5lb). Pack of 155 K'NEXMAN Headtop Translucent yellow plus 155 Headtop Black. Pack of K'NEX Tri Panel mini Silver. Weight 0.95Kg (2.1lb). Pack of K'NEX Connector 4-way Fluorescent Green. Weight 0.95Kg (2.1lb). Pack of K'NEX Clip with Rod end Green. Weight 0.95Kg (2.1lb). A good selection of 200 Classic K'NEX parts, at a 10% discount, for K'NEX enthusiasts who prefer to design and build their own models. Click on the image to view pack contents. 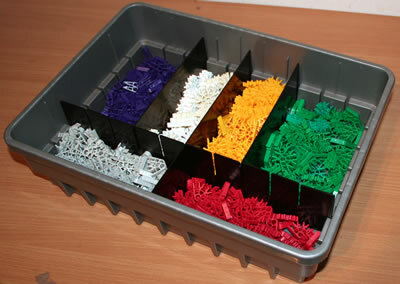 A pack of K'NEX Black 30cm track lengths and connectors, as used in sets such as the K'NEX Real Bridges set. It is quite amazing how many different models can be built using just two classic K'NEX components - the connector 5-way yellow and the rod 86mm yellow. These two parts can be connected imaginatively via a combination of end-on and side-on connections, to create a wide range of model types and sizes. The "Just Yellow" pack contains approx. 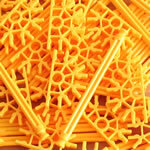 120 x K'NEX Rod 86mm Yellow plus 90 x K'NEX Connector 5-way Yellow. Total weight at least 0.46Kg (1lb).